Podersdorf is oneof the most popular destinations on Lake Neusiedler. The charming town draws nature enthusiasts, sun worshippers and water lovers. Podersdorf is located on the eastern shores of Lake Neusiedler and forms part of the Neusiedler See-Seewinkel National Park. Podersdorf is a great place to unplug from daily life and enjoy Burgenland’s serene beauty! 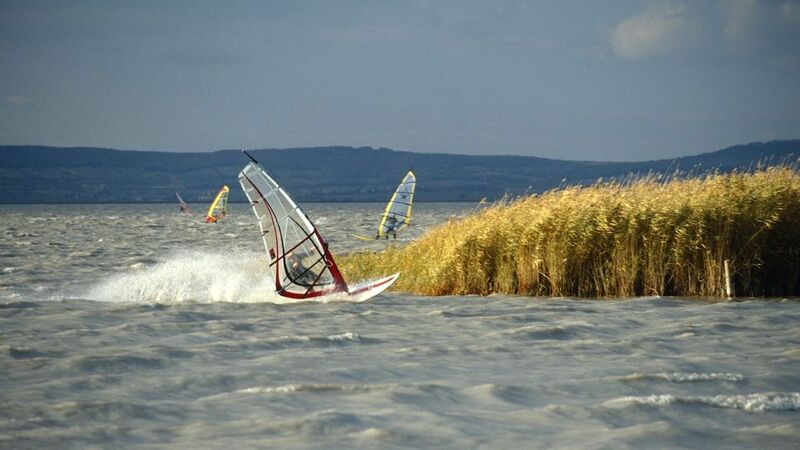 Thanks to its beautiful bathing beaches, pleasant climate, many hours of sunshine and consistent wind, Lake Neusiedler is popular with swimmers, sailors and wind surfers - it also plays host to the Surf World Cup, drawing some of the best wind and kite surfers. Other popular activities include cycling and hiking. A must is a visit to a local Heuriger where you sample wines and food. Another highlight is Podersdorf’s windmill, one of the two left in Austria. St. Martins Therme in Podersdorf is open year round, its indoor and outdoor pools are perfect for unlimited relaxation. Parents unwind in the spa knowing their kids will have a blast at the Kids Club, the water park and the playrooms. Podersdorf offers a good selection of accommodations for all tastes, including hotels, apartments and B&Bs on the lake. PODERSDORF - a lakeside holiday at its best ENJOY THE ULTIMATE HOLIDAY! Whether surfing, sailing or kite surfing, pleasant pedal boat rides, basking in the sun or entertainment: You (and your kids) decide what suits you! Just as the fancy takes you - because vacationing is to be fun. Podersdorf am See is the biggest and most important tourist resort at Seewinkel and the only place directly located at the lake. The brand new family and adventure beach bath with lighthouse and special events has Caribbean flair. The SURF CENTER of international standard, beach-volley ball, the inline skating park on the north beach and the FAMILY PARADISE with water playground on the south beach make holiday dreams come true. Explore the Neusiedler See-Seewinkel national park on foot, by bike or on horseback.